We practiced our skills on our friends and family and did styled shoots with flowers bought from Kroger and best friends wearing old prom dresses. We would go to local parks and just practice session after session our first year working together. Our first year doing a bridal show we brought these bad boys with our best work on the back of the pricing info. We switched the name in 2018 as I took on the bulk of the wedding photography work. This was my first logo and pricing page. I loved this photo of Carla & Josh so naturally I made it the only photo on my pricing page. Haha! I still can’t remember why I just chose one photo?? 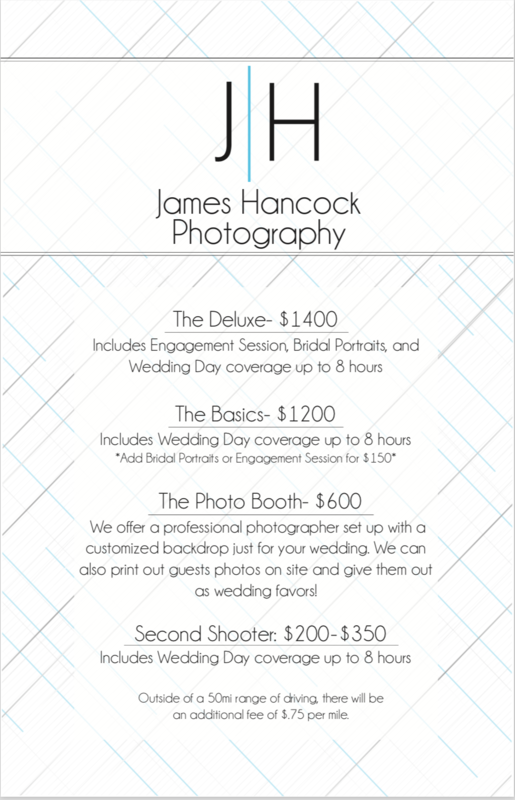 This past year James and I invested in a much nicer way to share our pricing. We now have a unique pricing booklet that goes into detail about our services!! I love how this project came together and I was surprised to hear so many of our 2019 couples still look through it even after booking! This photo is just the cover of the booklet. As 2018 was coming to a close, I knew I wanted 2019 to be different and I knew that had to start with my professional branding. I reached out to a few designers during that week in-between Christmas and New Years (you know, the week when you have no idea what day is but it’s not the new year yet) with my multiple pages of notes. I knew what I wanted but had NO IDEA how to do it. So investing in a quality designer to create my site was a must! I stumbled upon a local business in Lynchburg called Modernly Creative. I immediately connected with Mehgan and her style of business. She was so patient with my MANY questions and recommended things I never even thought about! She not only made time for me in the busiest time of year but she finished my website within a month!! I have already filled my books for 2019 and started on 2020!! This has also allowed me to accomplish one of my big goals for the year which is blogging!! I have so much to blog over the next few months and I never realized how difficult it would be to write these posts but I am so excited to share about my couples, my business, and my personal life! Follow Modernly Creative on Instagram and Facebook to see other Lynchburg creative’s rebrand and new websites done by Mehgan. I know of some big changes coming up for some dear friends of mine and I can’t wait to cheer them on!!! If you are in need of a rebrand or new site for your business she is your girl!! You have completely blown me away with your hard work and design abilities! I love everything about my site and new branding. I am so grateful for this fresh start and new chapter in my business. It has given me a rejuvenated confidence in myself as a person and a small business owner! Keep an eye out for my first 2019 EHP Couple coming up next week on my first Wedding Wednesday post! may not reflect current pricing, services, and contact info.